Above & Below: Essie's Angora Cardi, outdoors with no flash. Essie's Fall 2009 collection is called Cuddle with Color and it is a unique offering of shades for this season. In addition to the 4 'Fall-Like' shades, the set also includes a hot pink (Pink Parka) and an electric orange (Bright Tights). Today's NOTD is Angora Cardi, described by Essie as a dusty rose. 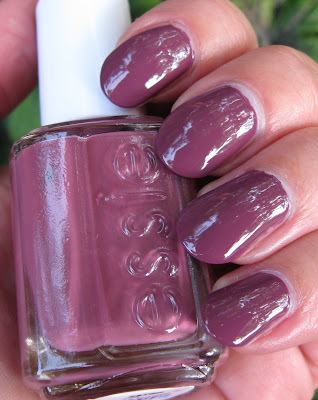 I would agree with that description, as in my mind I described it as a vintage violet or a darker shade of mauve before I read Essie's description. It is a creme shade that applied nicely in 2 coats and dried to a high gloss finish. I'll be the first to admit that when I first saw this collection, I didn't think too much about it. But the more I looked at it, the more I wanted it. Chinchilly and Mink Muffs were the shades that sparked the most interest for me initially, but after looking repeatedly at all of the colors, I realized that it's really a fun and trendy collection to have for Fall. lovely shade, very suitable for fall:) this one and mink muffs are my favourites in this collection. What a gorgeous pictures of this color ! And its shade - I really like it on you. I love the colour!I must have some of those in my next order, perfect for fall! That's a very pretty color on you. I'm interested in the same two as you. Every polish looks so pretty swatched and in nice light. I want them all! By the way I got my bank card on Friday. I haven't bought anything yet! Give me a bit of time and I will do some damage. I bought this one, too, and I really like it. This is such a classic shade, it's lovely on you! Konadomania~it is pretty once I applied it. I wasn't so sure, but I do like it now. Chocaddict~I wasn't crazy about it either at first, mauves can look a bit odd on me! But I love it now. Katie~it's a nice shade for Fall of Spring, isn't it? Lucy~glad you like this shade. I have no doubt you'll do damage with your bank card~ha-ha! Nosaby~it's very pretty, I like the 'dusty' or 'muted' look to this shade. BeautyJudy~thank you! It's a nice collection for Fall and many of the colors can certainly be used in other seasons. Kae~the answer is always 'to buy' rather than 'not to buy'! This shade would look beautiful on you! Berry T~I think I would have regretted it too! I'm happy with it. Moonchaii~I tried to narrow it down to just 3-4, but then I realized I wouldn't be happy unless I had them all! Nail Fanatic~glad to hear I'm not the only indecisive one! It's a very pretty group of colors though.